Blowout Sale! 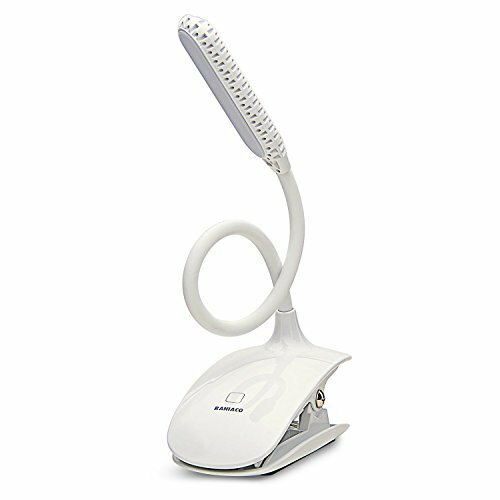 Save 52% on the Led Clip Reading Light, Raniaco Daylight 12 Leds Reading Lamp-3 Brightness,USB Rechargeable, Touch Switch Bedside Book Light with Good Eye Protection Brightness by Raniaco at EOS Lighting LLC. MPN: RARL001. Hurry! Limited time offer. Offer valid only while supplies last. Features: Touch Sensor Switch with Adjustable Light: You can keep it glowing with a single touch and you can adjust it to suit your needs. Touch Sensor Switch with Adjustable Light: You can keep it glowing with a single touch and you can adjust it to suit your needs. Streamlined design:The led reading lamp has 3 levels of Brightness (Soft, Bright and Strong light levels). The smart touch sensor helps you get the right flow that does not affect your eyes. The light looks like Natural light! The lamp can work for 24 hours in dim brightness mode:12 hours in medium light and 6 hours in the brightest light. Safety Charging Indicator: The Indicator is red when it is charging and automatically goes off when the Battery is fully charged. Long Battery Life: Built in high capacity 1000mAh lithium battery. Good for Home, Office, Camping and other unique lighting needs! Light can be adjusted from different angles. Portable and Versatile; It is robust and delivers with precision. The battery is discharged when lamp is dimming. Please stop using the lamp and recharge so it does not impair the performance of the battery and reduce its lifetime. ✔With 12 LED Bulbs And Long Battery Life Of 24 Hours: The frosted lampshade design is unique. The Soft light is ideal for your eyes as it does not flicker or produce negative radiation. We offer 60 DAYS' FULL MONEY BACK, 3-YEAR FREE REPLACEMENT!! If you have any questions about this product by Raniaco, contact us by completing and submitting the form below. If you are looking for a specif part number, please include it with your message.